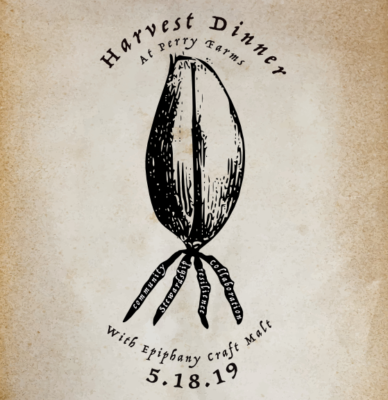 Come see where your beer is grown at a Harvest Dinner 5/18/19 at Perry Farms. 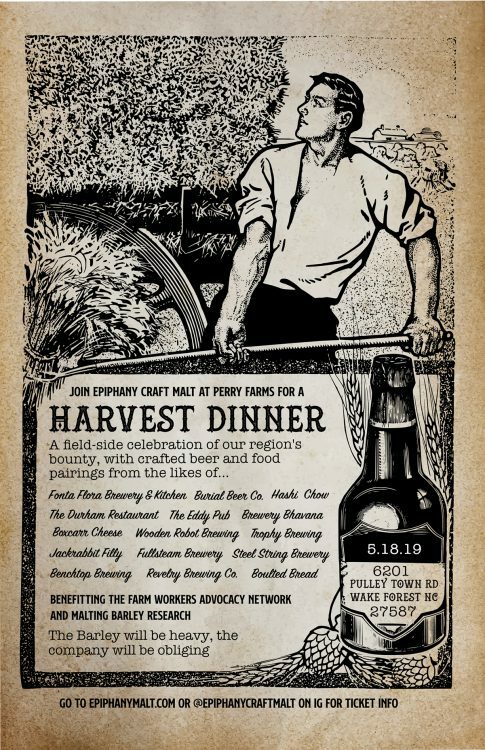 Cocktail hour and Field tours with the farmer start at 5pm, followed by a multi course chef and beer pairings made with Epiphany Craft Malt at 6pm. You will be treated to curated dishes from the Chefs from The Durham Hotel and Restaurant, The Eddy Pub, Fonta Flora’s new Food Concept (formerly of Wisteria Southern Gastro Pub), Boxcarr Cheese, Boulted Bread,Hoshi Pop up and more! This will be paired with delicious beers from the likes of Brewery Bhavana, Fonta Flora Brewery, Burial Beer Co, Revelry Brewing, Steel String Brewing, Benchtop Brewing and more! Proceeds from this event will go to the Farm Workers Advocacy Network, and Malting Barley Farming Research. Come have a seat at the table and learn how brewers, farmers, and maltsters are working closely together to change our regional agricultural landscape while creating distinct Beer and Distillates with a sense of place.